Digital artists tired of being tethered to their desks by cumbersome cabling will appreciate Wacom’s latest addition to the pen tablet market—the Intuos4 Wireless. The Intuos4 Wireless aligns its Touch Ring and customizable ExpressKeys on one side of the tablet enabling 180 degree rotation, for use by both righties and lefties. As excited as I was about the new wireless Intuos, I’ll admit that I had some initial concerns regarding size, battery life, and performance—all of which proved unfounded. As a fan of the slim profile of last year’s Intuos4 M, I was worried that adding a battery pack would add bulk. Wrong. The device’s removable, rechargeable battery is about the size of a cell phone’s. And at .6 inches thick, the wireless tablet is only a tenth of an inch thicker than its tethered brother, with no resulting gain in weight. At 8-by-5 inches, the wireless tablet’s active drawing surface is slightly smaller than that of the wired medium-sized Intuos (which is 8.8-by-5.5 inches). But without using a ruler to measure, I never would have noticed. The tablet still maps perfectly to a standard 16:10 (aspect ratio) or 1920-by-1200-pixel-per-inch monitor. After charging the unit overnight, I found the Intuos4 Wireless easily operated several hours with no battery issues whatsoever. After 30 minutes of non-use, the tablet automatically goes to sleep to conserve energy. And even when you do need to recharge via the provided USB cable, there’s no down time; you can still use the Intuos as a wired tablet while recharging. My fears that Bluetooth wouldn’t be able to “keep up” were baseless. Other than sometimes taking a moment to wake up after a long period of non-use, I could detect no difference in performance between Bluetooth and wired performance. Given the fact that you’ll need a monitor within viewing distance to use the tablet effectively, it’s unlikely that the 33-foot (10 meter) limitation on wireless range will ever be an issue. 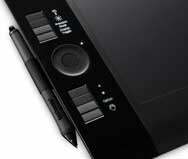 Note that, at present, the Intuos4 Wireless is available in only one size. So if you need a larger drawing area, you’ll have to stick with the wired version. Also, you will need a Bluetooth-equipped computer (or add-on Bluetooth adapter) to operate the tablet wirelessly. Finally, unlike previous Intuos4 incarnations, the Intuos4 Wireless does not include an accessory mouse. 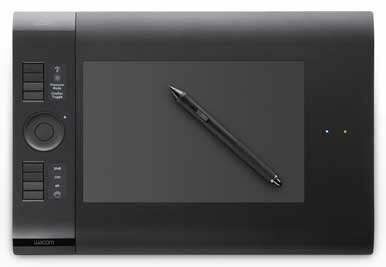 That said, I’ve never really understood why Wacom includes a mouse with its pen tablets in the first place. Odds are many users will never miss it. The tablet ships with a driver installation CD, which also includes an electronic manual. While there is no bundled third-party software CD/DVD included, buyers who register their tablet are entitled to download Intuos-compatible software such as Adobe Photoshop Elements 6, Autodesk SketchBook Pro 2010, and Corel Painter Sketch Pad (a great little program for showing off your tablet’s pressure and pen-tilt sensitivity). Buyers can also download Nik Color Efex Pro WE6 and Wacom Brushes 3.0, both plug-ins for Adobe Photoshop and Photoshop Elements. If you find the idea of kicking back on your office futon and sketching–cable-free–on your 46-inch flat-screen appealing, then the Intuos4 Wireless is for you. Its 2048 levels of pressure sensitivity, programmable ExpressKeys, Touch Ring, and OLED display make it a great graphics tablet for both first-time buyers and Intuos3 owners looking to upgrade. Programmable ExpressKeys with illuminated labels.